We can be our own biggest enemies when it comes to our businesses. Negative self talk and limiting beliefs about abilities are very real things. We have to face not only our fears, but the harder to see things like our insecurities, our misplaced beliefs, and our own shortsightedness to really begin to thrive. Imposter syndrome is real and can be lethal to a small business owner. It’s is the belief that you are a fraud and don’t actually have any skills or talents in your field. -Who am I to tell people what to think or buy? -I don’t have any real talent. -If I was really gifted, I’d have what X already has. -I can’t do what that person asked me to do. Impost syndrome can be brutal. Working through it requires that you face your fears completely. You look at the things that scare and intimidate you, and you ask why they have that effect on you. Ask yourself where your fear comes from. Did you fail at something in the past? Do you think family and friends will look at you differently if you fail? Are you scared of losing something that you have, like money or your home? Getting to the root of where your fears come from will help you dismantle those fears. Next up: you must come up with reasons that your imposter syndrome is lying to you. You have to disprove that little voice in your head. -Write out a list of your accomplishments in the last year. These can be both personal and professional: the point is to see all the great things you’ve done. -Find a hype man. Call someone who loves you and ask them to say a few things about you that they admire or like. Hearing compliments from another person can be uplifting. Repeat this process as many times as you need. Working through imposter syndrome usually takes some time. Be generous with yourself. The scarcity mindset is another very common mindset. It tells you that there isn’t enough of anything in your life, so you have to cling to what you do have. Whether it’s love, money, or success, the scarcity mindset tells you that things are hard or perhaps impossible to come by. Your actions therefore stem from a place of fear and lacking. If you think that there won’t be enough food for you tomorrow, you won’t share any food you have today. Scarcity mindsets are therefore a double whammy of negativity; not only do you believe that you’ll never be able to achieve more, you also close yourself off to partnerships with other people. -Avoid comparisons. Don’t see other people’s success as your inherent failure. Just because someone has something you don’t doesn’t mean you will never get it. Spend time away from things (like social media) that make you play the comparison game. -Adopt a daily affirmation. Once a day, say out loud an affirmation that reinforces an abundance mindset. 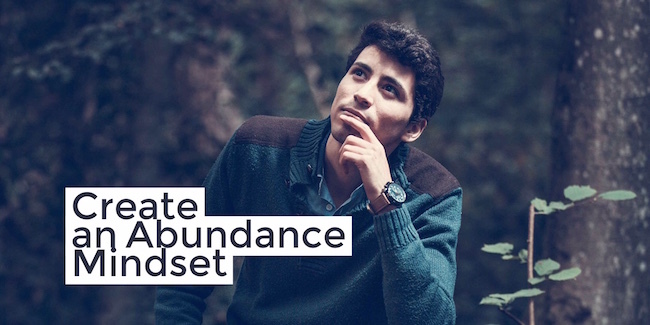 Abundance is the opposite of scarcity, so introducing that into your life will help fight your old mindset. Something like “I am bringing more wealth into my life each day” introduces the belief that you are heading in the right direction. It says that your hopes are achievable, and that more of the things you want are coming your way. Working on your business is necessary to success. But working on yourself is just as necessary. Stamp out the negative beliefs and welcome in the positive ones.